School started yesterday in France and I cannot tell you how glad I am... I have so many projects waiting for me ! Looks like a Valentine's card... Am I too early ? Nah ! 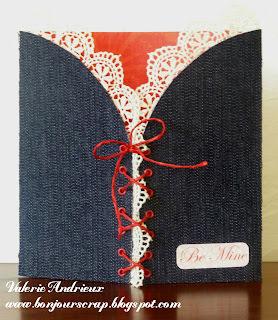 I used a red paper from the Old World stack (DCWV), a denim fabric on paper (DCWV), lace and cord found at Hobby Lobby and Making Memories eyelets. And a tiny sticker from an old Spring specialty sticker stack (DCWV) for the sentiment. Love love love your card ! It's such a great idea !